Note: Drums are Sold Individually. 2 drums are required to do an axle. 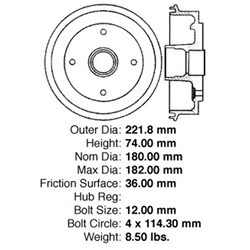 A high quality, direct fit OE replacement brake drum. Provides support to the braking components of the vehicle. Facilitates proper rolling of the wheels. Withstands high speed and heavy loads. Engineered and manufactured for high performance braking.